This afternoon I have been able to put up for sale on KT Miniatures website, some of the final pieces from the stock that was taken to Thame Fair; all from the 1930s and part of the wonderful collection that was found in an old attic by a builder. 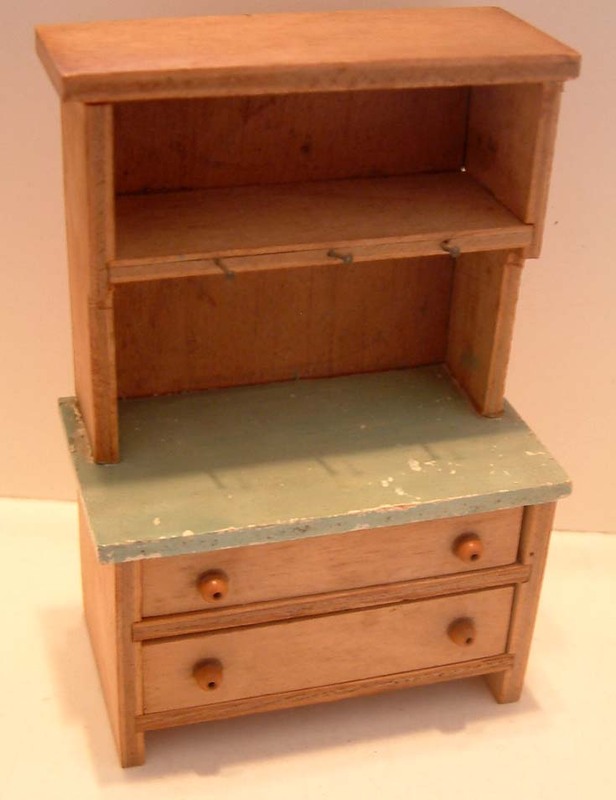 There is this delightful wooden kitchen dresser, thought to possibly be Tiny Toy. 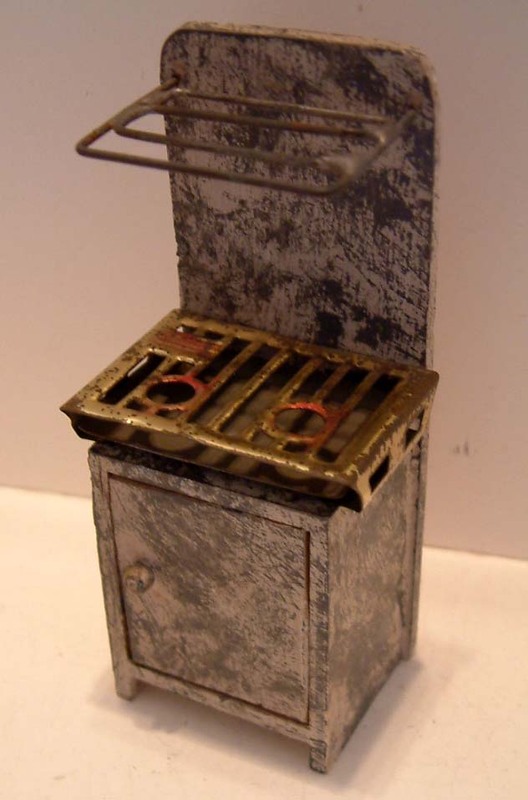 It is in a good played with condition and has been put up for sale on the Antique 1/12th scale Kitchen Page along with the other kitchen items below. 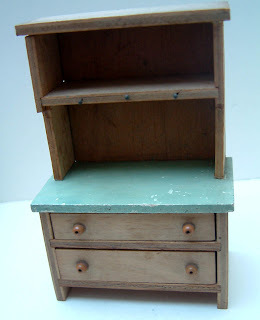 The two drawers with bead knobs open and there are three little nail hooks....would look fabulous with some old china teacups hanging from there. 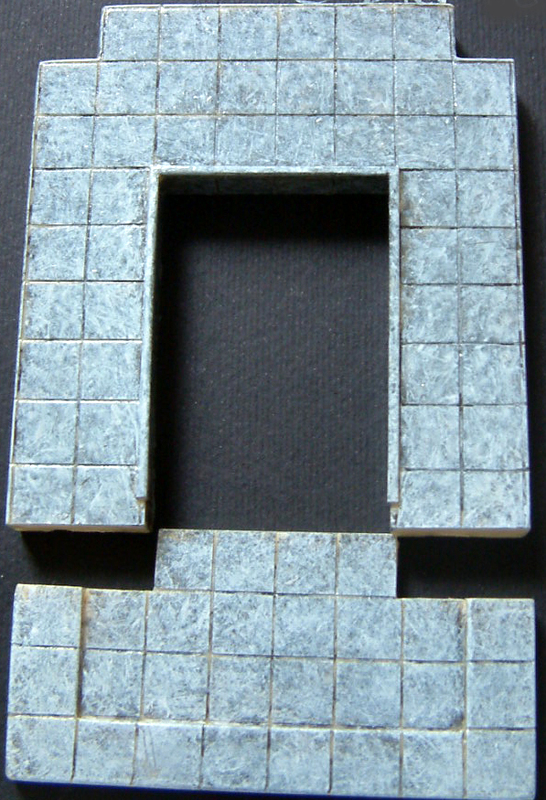 A nice touch is the pale greenyblue worktop - so pretty! 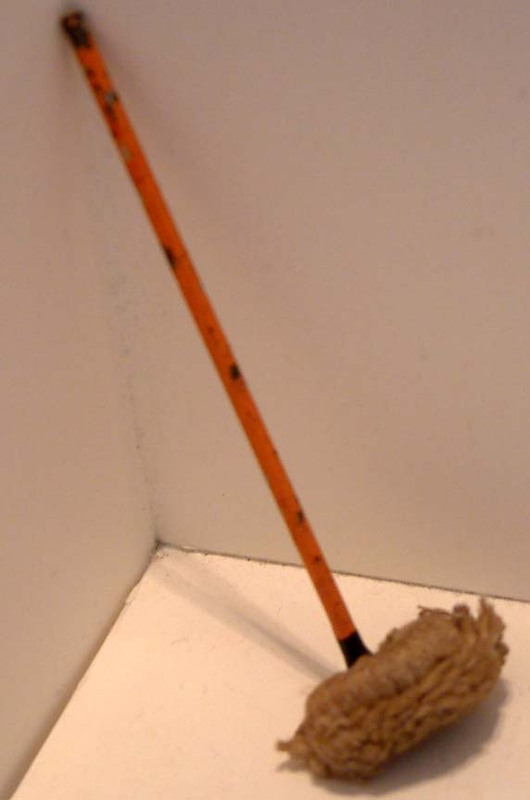 The German carpet sweeper is all metal with a bristle brush underneath...how fabulous is that? 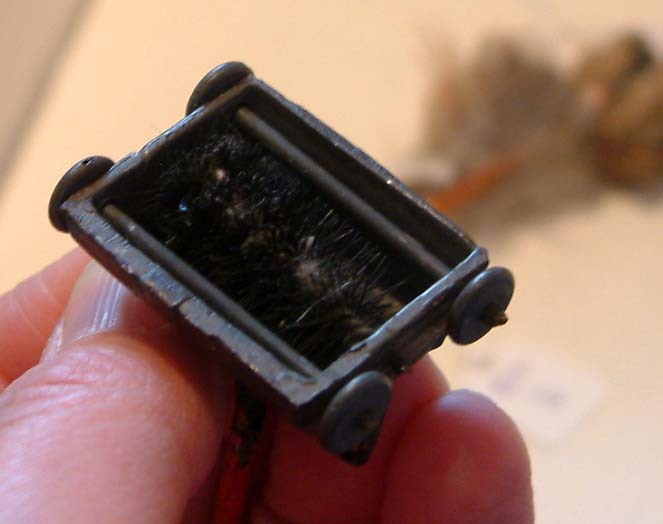 From the fluff that has collected on the bristles....one can imagine the previous young owner back in the 1930s embarking on her miniature housework....(sorry if I sound sexist but back in those pre WW2 days the dolls house would undoubtedly have belonged to the female children of the household)!!! 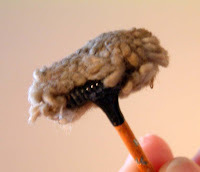 There is also a wonderful metal mop with woollen mop head over a metal frame plus a little feather duster. Judging by the slightly grubby mop head, does make me wonder whether the original young owner did actually mop her dolls house kitchen floor with it? 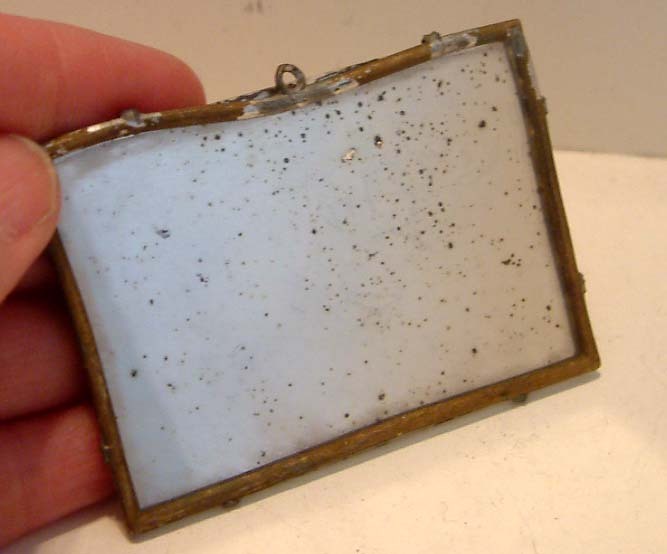 I think this 1930s metal framed mirror is wonderful...... admittedly the mirror is sligthly tarnished and the gold paint has worn away in places...but hey, this is just how I love it!!! I spend hours making my handmade items to look naturally aged. 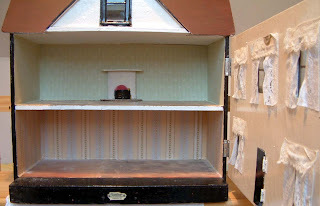 The mirror can be found on the Antique 1/12th Living & Dining Room page however it would look grand in various dolls house rooms such as a hall or even bedroom. 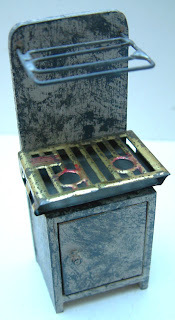 Finally there is quite a rare Tiny Toy gas cooker that has just been listed on the Vintage 1/16th scale Others Page.....it is the first one that has come in over nearly 15 years of trading....so that gives you an indication on how this particular piece does not come along very often. The mottled paint finish may not be to everyone's taste but I think it is delightful. 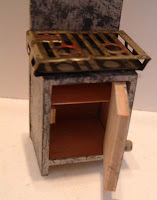 It is of wooden construction with a metal plate rack and hob top. Most of the unsold stock from Thame Fair has now been listed....there are just two room boxes then that is more or less it. 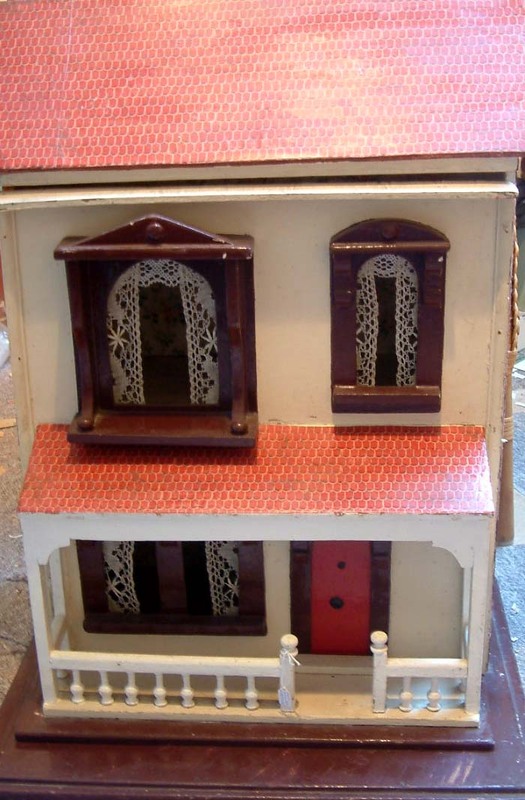 Sorry if anyone is waiting to see the c1920s G&J Lines Dolls House listed for sale on KT Miniatures.....it has now been sold. I have finally finished uploading most of the unsold Thame Fair stock of handmade pieces under the Exclusive Items section on KT Miniatures website, so am now in the process of uploading many of the vintage items. And what wonderful items there are!! You have seen this G&J Lines No 30 CIRCA 1907-1915 before on an earlier posting, however it has now gone up for general sale, in a restored condition with some wonderful original features. 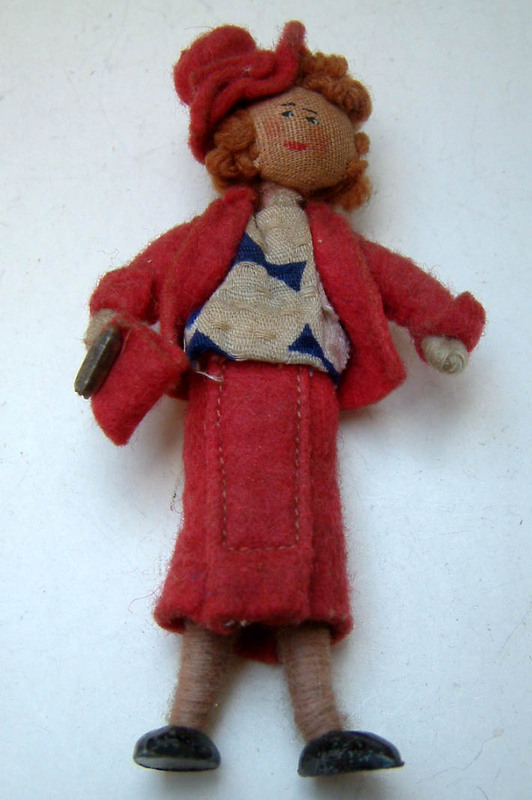 And finally today I have been able to put up for sale the remaining 1930s/early wartime Grecon dolls. They are adorable and quite rare. Their feet are kipper like, not like the normal kind of Grecon feet so these could have been alternative feet during early wartime when the normal supply were unobtainable? I would just like to extend a warm welcome to several new "Followers" to this blog who have recently joined over the past few days. 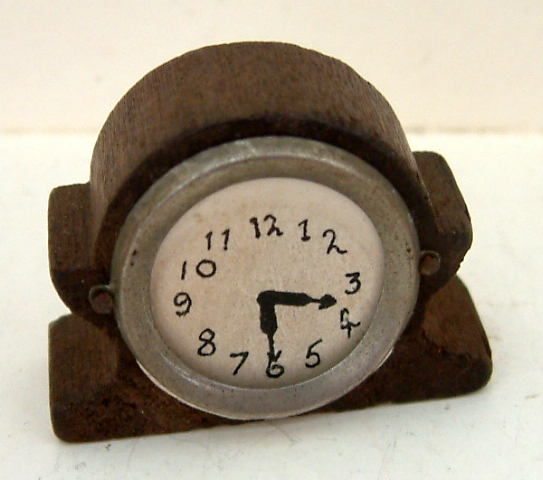 Ok..am now embarking on the mammoth task of uploading all new unsold stock (handmade and vintage) from Thame Fair.......commencing with the handmade items first & will highlight a few pieces here. Many of these items have been created with a slightly aged finish to give a hint of realism so can be used in both reproduction dolls houses and vintage houses alike. 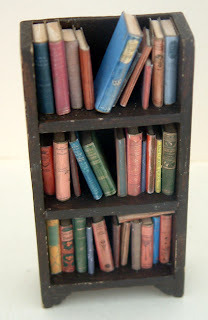 Just loaded up to KT Miniatures LIVING ROOM PAGE yesterday are various items such as yet more filled 1930s bookcases (which has been one of my best sellers for years), three more aged settees, several 1930s -1960s tiled fireplaces (large & small) and some handpainted flying ducks. On the KITCHEN PAGE there are various 1930s/40s packaging sets (all made by KT Miniatures), various wall food cupboards with mock glass doors, 1930s/40s gas cookers.....and more! Instantly recognisable, painted in such a way to make it suitable for use from 1930s onwards. There is a grill pan too and the oven door opens to reveal two shelves. 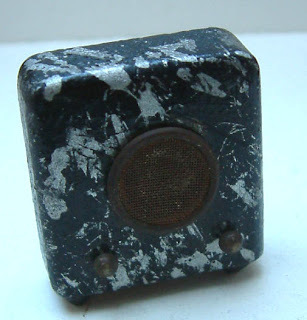 Today I have uploaded items to the WORLD WAR 2 PAGE . There are still all the usual favourites including at long last some more ARP shelves - apologies for those who were waiting for these....finally got around to making some more!!! Another aged cream metal bed with mattress plus some more biblical prints and aged enamel potties have been added to the BEDROOM PAGE. 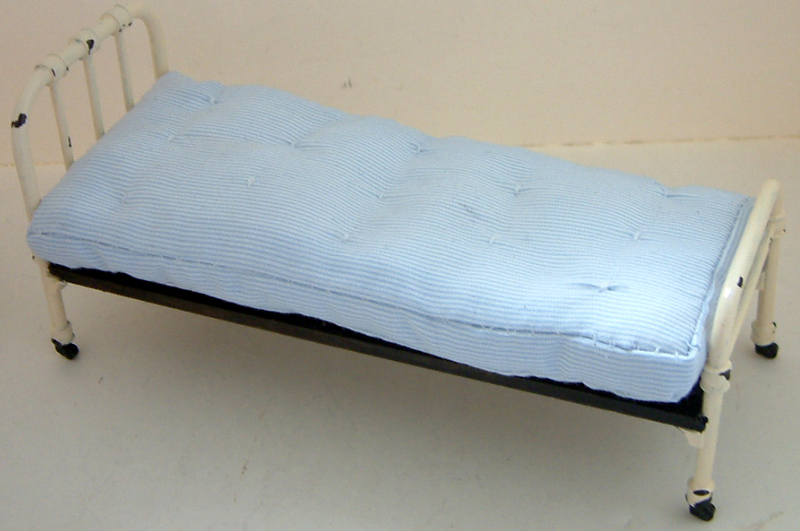 These beds proved to be a big seller at Thame and only have one left. 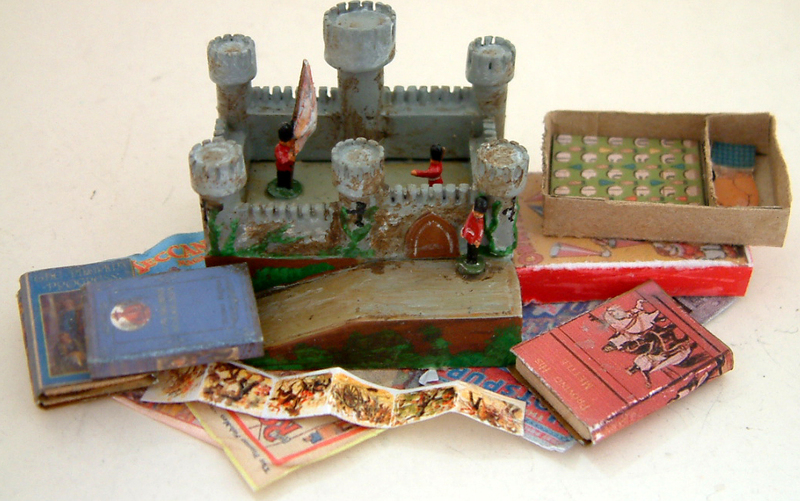 Several new set pieces have been added to the CHILDHOOD PAGE including ﻿boxes of children's books, more 1930s children's quoits, shelves filled with children's books plus some set pieces of various toys with books etc., including this castle with several 1930s children's books & an Oh My Hat game. There are even some tiny soldiers inhabiting this castle! Tomorrow I hope to upload all the unsold stock from the handmade General Page....plus make a start on loading many of the unsold vintage pieces that were seen at Thame Fair last Saturday. I am chuffed to announce that the amount raised on Saturday at Thame Dolls House & Miniatures Fair for Breast Cancer Campaign was a magnificent £2,520.66 (and theres still a bit more to come)!! As we are slap bang in the middle of a recession this makes it even more amazing. Huge thanks to everyone who contributed. 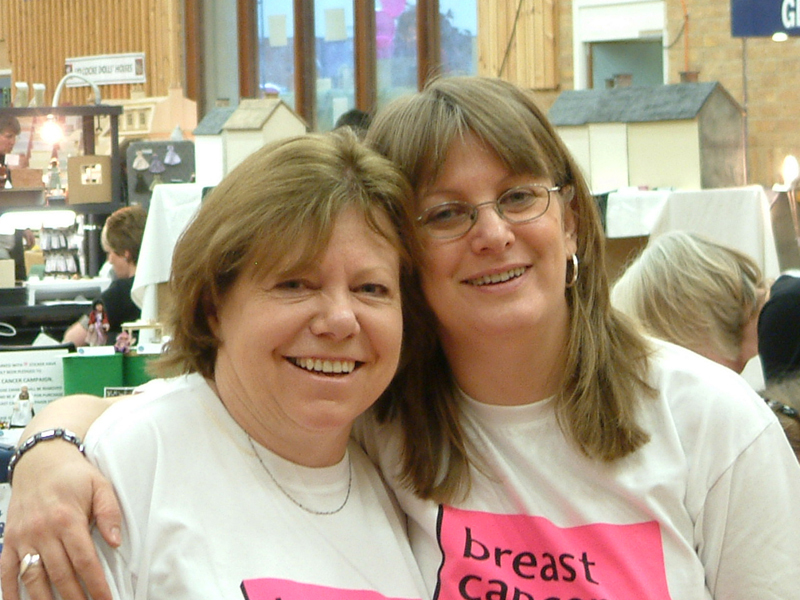 I would just like to give special thanks to these two exceptional ladies who have run the charity sales table at Thame from the very beginning.... Melodie and Jill, two mates of mine who I have known for literally years. Visitors to Thame Fair will immediately recognise them. The charity stall was totally overwhelmed by both customers and continual donations that just kept on coming so the volunteers were totally rushed off their feet. Jill and Melodie said that in all the years they have run the sales table, they have never know such a constant stream of customers or for donations of items to be so plentiful...it was simply amazing. Members of the Thame Dolls House Club rallied with extra help plus my daughter and another very special lady who will probably blush hugely when she reads this - Norma, a visitor from Wiltshire, literally rolled her sleeves up and stepped behind the stand to serve for a couple of hours too. THANK YOU LADIES - YOU WERE ALL BRILLIANT!!!! PHEW........SO THERE YOU GO, ALL OVER FOR ANOTHER YEAR. 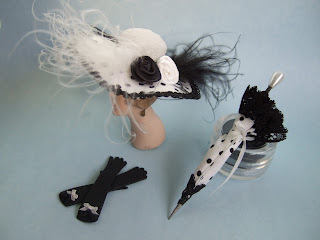 However I understand from the organisers that the next Thame Dolls House & Miniatures Fair is already booked for Saturday 18th February 2012....so roll on next year!!! 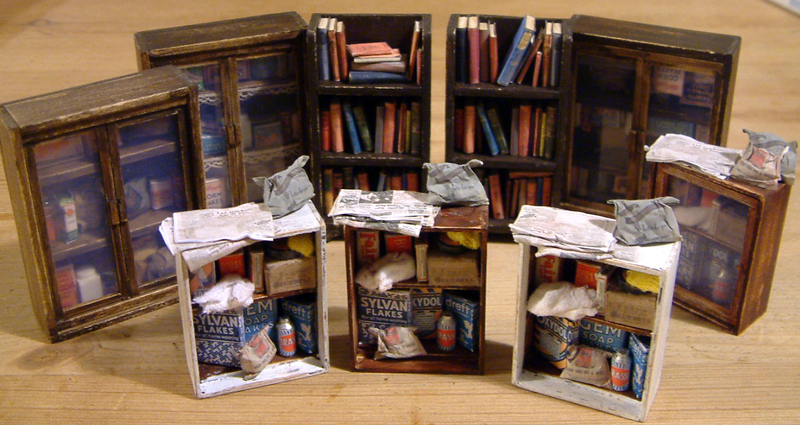 Now that my injured wrist is healing, I can embark properly on loading up new unsold stock to KT Miniatures website. 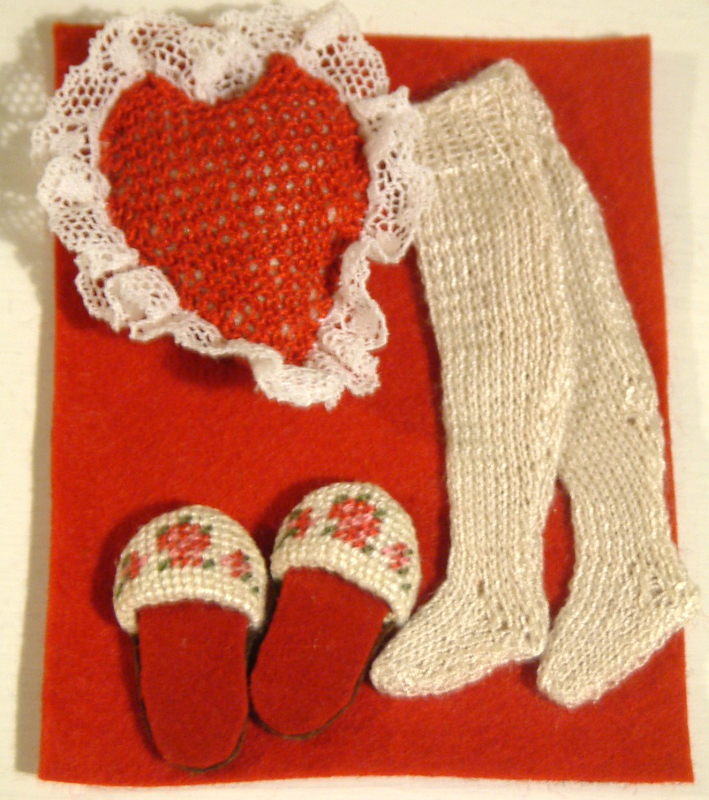 I am starting with the handmade items....more news about them tomorrow. Thame Dolls House & Miniatures Fair - Wow! I am pleased to report that Saturday's Thame Fair was a fabulous success. Congratulations to the new owners Ron & Felicity Holland on putting on a wonderful fair. It has been hard for me to let go having been the previous organiser but I can safely say that it is definitely in safe hands! The atmosphere was as always, lovely - there is something very special about the event. 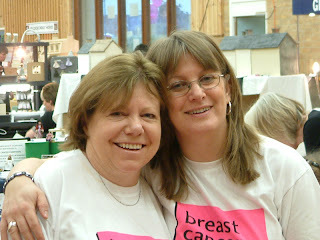 As soon as we have an amount raised for Breast Cancer Campaign from the day, I will let you know. I still have several raffle winners to contact...so you may be one of the lucky ones if you bought a ticket on Saturday!!! 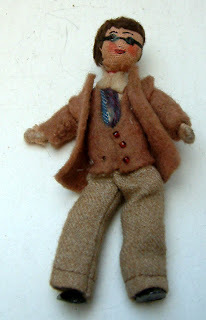 For those of you who were not able to come to the event, I do have lots of stock (handmade and vintage) to load up for sale onto KT Miniatures. I will start photographing them and listing them today however......umm...lets just say as I sit here my right wrist is strapped up and hand like a balloon due to spraining over weekend from carrying heavy stand shelving etc, so am attempting to type with left hand mostly and the odd finger from my right hand - ouch!!! So listing is going to take much longer than anticipated and will be spread over the next few days. Thanks again for everyone who contributed to the charity and it was lovely to see so many of you. We had some wonderful "chats"!!!! Breast Cancer Campaign Fund Raising- Some Beautiful Donations - Thame Fair! I had the most pleasurable task yesterday of sorting through and pricing up all the dozens and dozens of donated miniature items from both artisans and members of the public for the Breast Cancer Campaign Sales Table that will be at Thame Dolls House & Miniatures Fair this coming Saturday. A HUGE THANK YOU TO EVERYONE WHO DONATED - YOUR GENEROSITY IS OVERWHELMING & EVERY SINGLE ITEM IS VERY MUCH APPRECIATED! 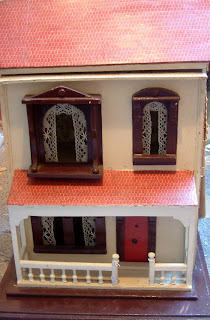 *A beautiful framed photograph of some vintage dolls house pieces donated by Caroline Taylor, a professional photographer - who has sadly lost a friend recently to breast cancer. 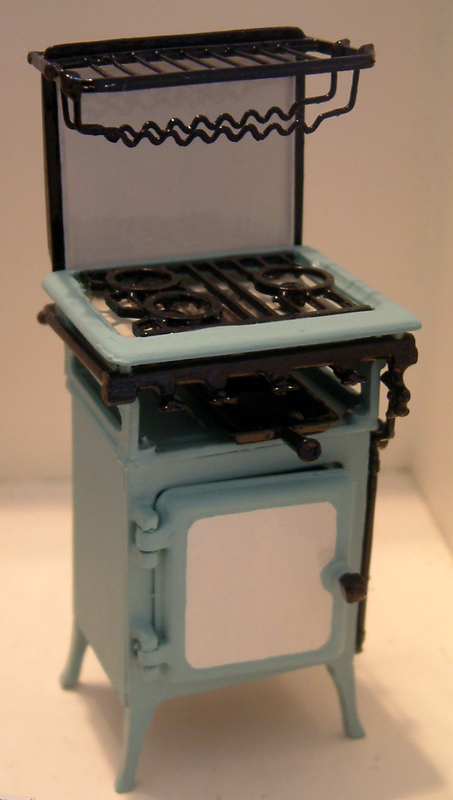 This photograph was exhibited by Caroline in her final year at art college. *Linda Hutchinson, teacher of Hardenhuish School, Chippenham, has donated her little toy stall that she made as an example to show her pupils for a class project. I understand donations for this table will be arriving throughout the day from various people...so well worth continually checking out throughout your visit. See below some of the more recent donations just come in over the past few days. 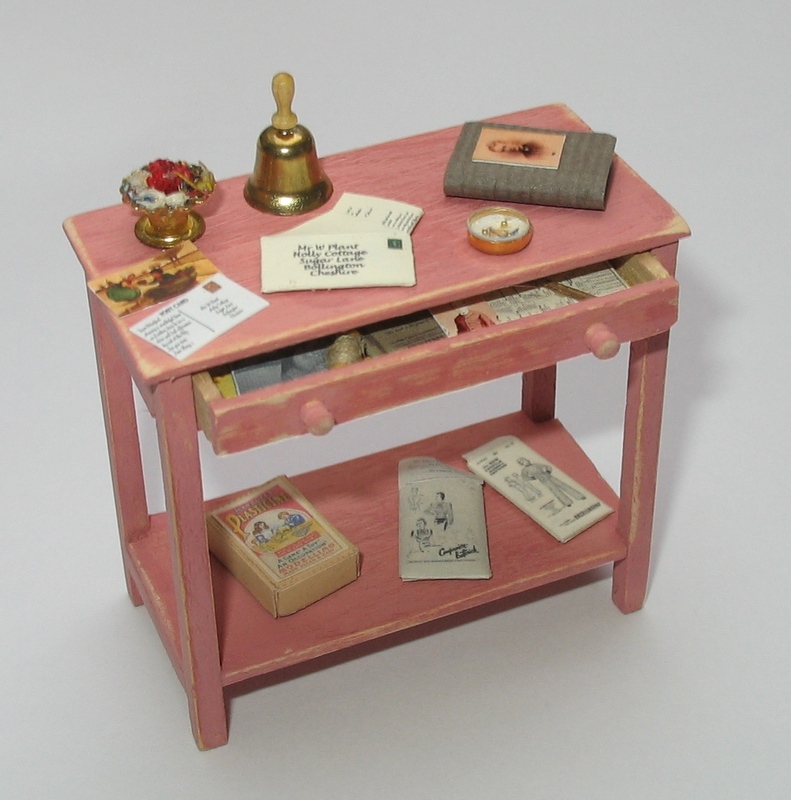 1/12th SCALE SIDE TABLE WITH ACCESSORIES PLUS £35.00 VOUCHER FOR JANE HARROP KITS OFF HER WEBSITE OR HANDMADE PIECES OR KITS OFF JANE'S STAND AT THAME FAIR. Plus there are many, many more that will be donated on the day by some of the stand holders.....so a truly fabulous raffle. The raffle draw will take place @ 3.30pm and as always the wonderful Thame Town Crier will conduct the proceedings in his totally unique way! Anthony Church is the Thame Town Crier and is now part of the fixtures and fittings of Thame Fair. He spends the good part of the day up in Thame town centre, enticing people to come to the very special Thame event, whilst at the same time jiggling his BCC collecting tin at people, then finishing up at the Thame Leisure Centre. Sorry we do not have a licence to sell raffle tickets outside the event so can only be purchased on the day. Tickets will be priced at £1.00 per ticket. There are over 60 handmade replica vintage books in this shop window! 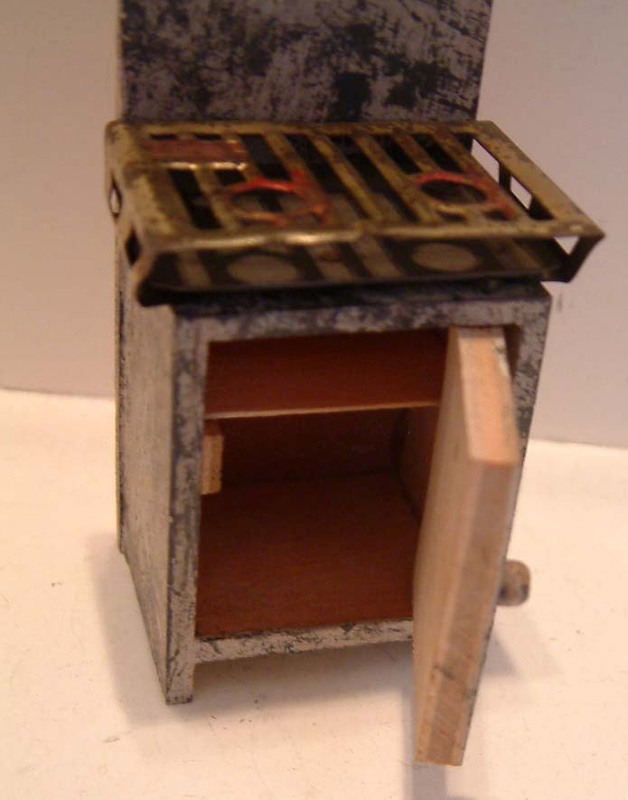 This LITTLE BOOK ARCADE will go up for sale at next Saturday's Thame Dolls House & Miniatures Fair. 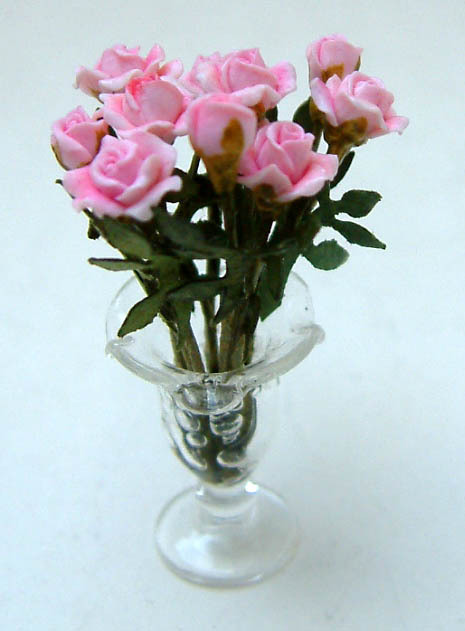 It is a bit of fun, small enough to sit on a shelf, mantlepiece or even hang on the wall. 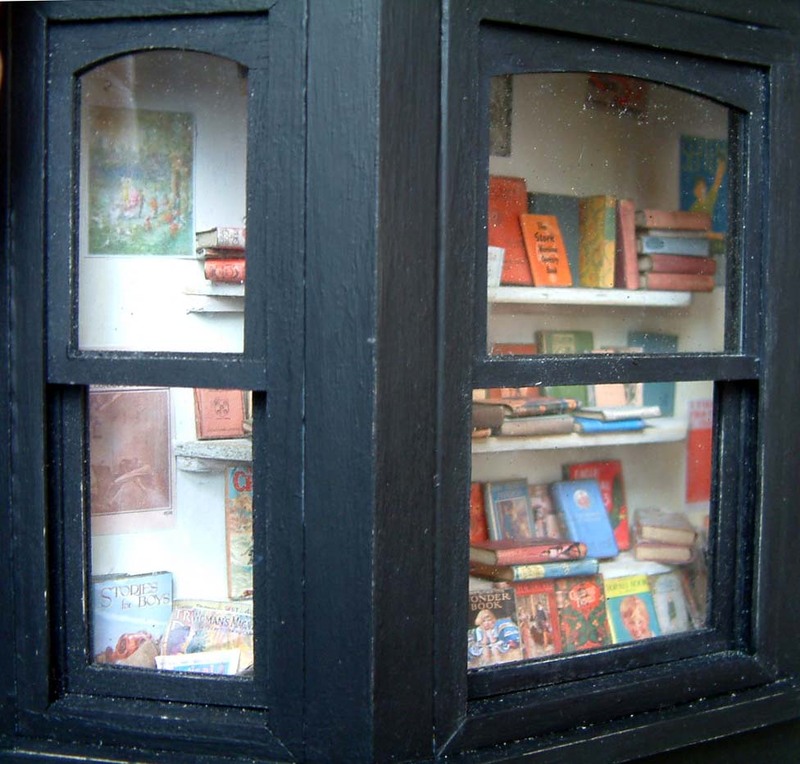 The sash windows open so whoever purchases this can add more bits to the shelves if they wish. These have been given a paint effect treatment in order to give the illusion that they are aged rexine sofas just like those from the 1930s! I have just completed more aged sofas with handpainted 1930s style cushions, fixed books, blankets/throws etc and will also be released for sale at Thame. For the first time, these have been created with castors underneath. All items are fixed. Also, just recently having emerged from my workroom, are four 1930s/40s gas cookers and three aged cream painted metal beds with lumpy old fashioned mattresses. One of the mattresses I have stained a little, just like old mattresses! 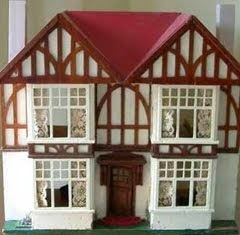 Another G&J Lines House that will be available at next week's Thame Dolls House & Miniatures Fair is a No. 30 dating from between 1907 & 1915. A very desirable residence................. with full occupancy (as they say)!!! Again, just like the No. 35 as seen on yesterday's posting, this was not in a great condition when it arrived. Not only had it relatively modern wallpaper inside but it was drawn all over in felt tip pen and biro!!! Plus the roof and exterior had modern paper so off it all had to come. Although I did not touch the frontage and left it just as it was, apart from a wipe over with damp cloth. 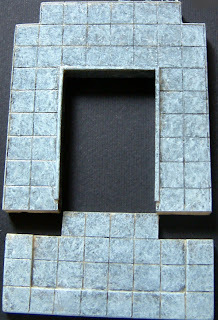 I chose to use water based paint around the two sides and back, similar in colour to the base and aged slightly. The roof was covered in replica Lines roofing paper from Dolls House Restoration and again, aged in order to give a hint of realism. 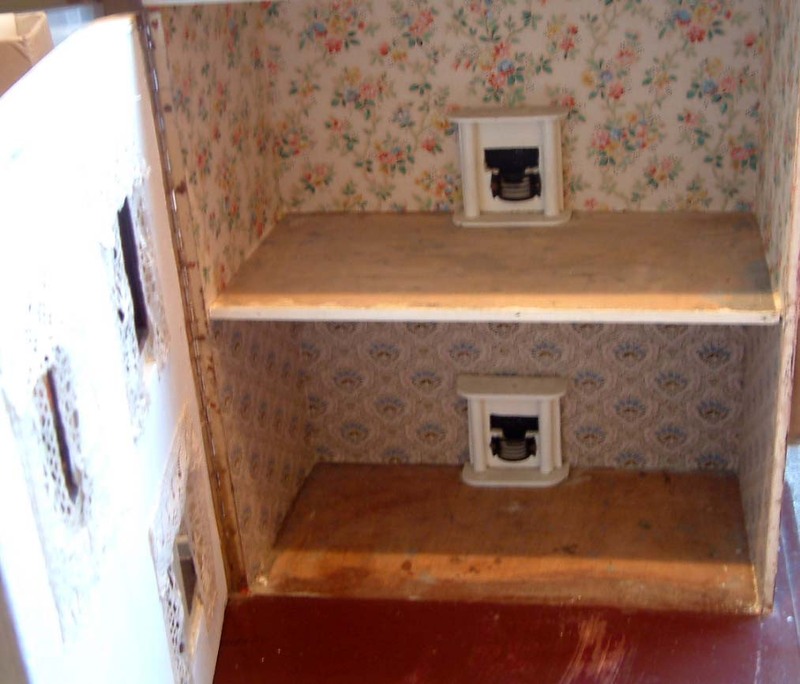 Beautiful early 1900s antique wallpaper line the interior walls and the flooring has been sanded. A bonus are the two delightful original fireplaces still remaining. Windows have been dressed with antique lace. This will be availabe along with much more at Thame Fair. Please see Thame Stock Page for a full list of both handmade and antique/vintage items that will be on my stand next week. 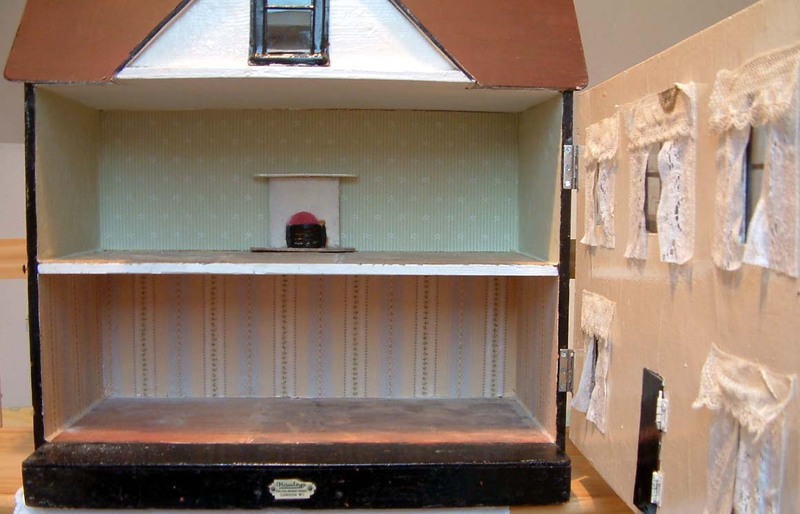 This extremely charming little circa early 1920s G &J Lines No.35 dolls house will be available for purchase at Thame Fair. 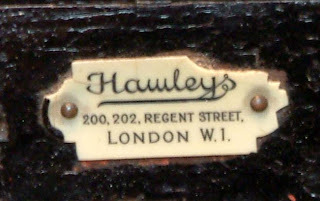 It still has its original Hamleys plaque on the front - wonderful! It was in a dreadful state when first acquired, having lost its original decor long ago and instead covered in a variety of papers ranging from 1960s/70s to 1990s. 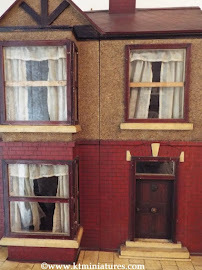 I decided to leave the frontage and sides well alone even though this faded cream gloss paint is not original (this was obviously done several decades ago and quite attractive in it's own right). The roof was a different story though, with 1990s roofing paper. This was removed and I have painted it with water based paints and a slightly aged finish. Inside, due to all original decor being completely devoid, it has been decorated with antique wallpaper and the floor left bare, now stripped of disgusting carpet residue. As a final touch I have added antique lace curtains and pelmets.........so this is now complete and ready to embark on a new chapter in its 90 year history! 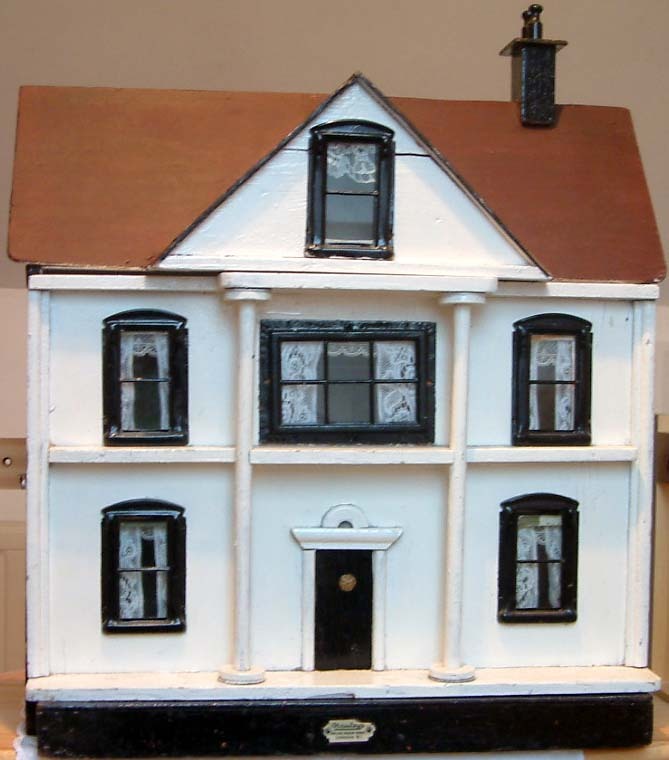 With THAME DOLLS HOUSE & MINIATURES FAIR just a few days away now ( 19th Feb), preparations are in their final stages. 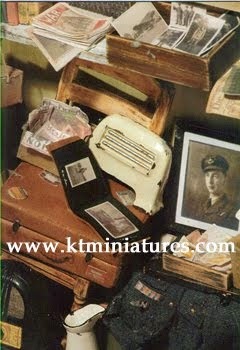 Here you can take a peek at some of the various vintage pieces that I will have for sale on KT Miniatures Stand. (Incidently my stand number will be No 29 which is in the main hall, same spot as usual near the exit doors). 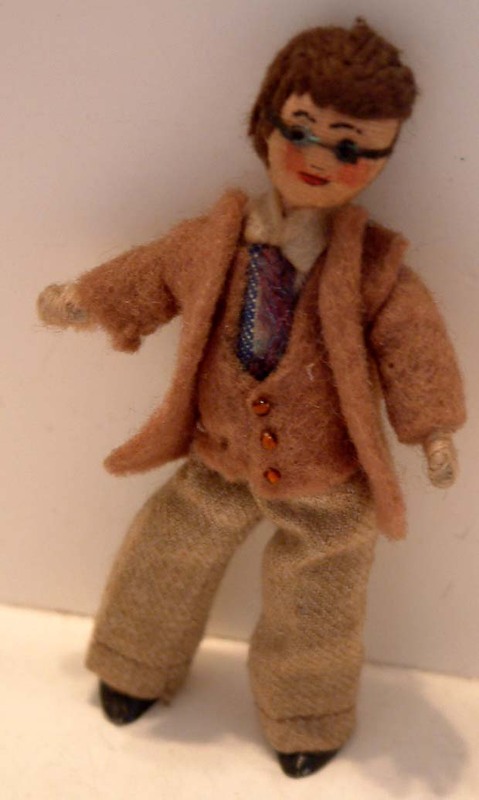 I have a selection of 1930s/early 40s furniture and old dolls that will be for sale on the day. The dresser and cooker above are believed to be Tiny Toy pieces .....absolutely delightful. Here is a very old wireless.....there is some debate amongst the experts whether this is a Tiny Toy wireless or Pit-a-Pat? 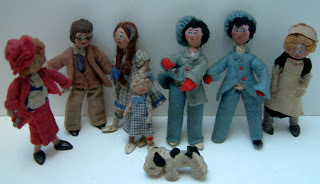 There is a gorgeous set of vintage dolls which have caused some considerable debate too. Initially I thought they were all Grecon apart from the maid who I thought was Tomac. But the feet on the Grecons are large & not like the normal shaped lead feet. One expert has told me that she thinks that most of these dolls are Grecon and made during the war when the normal supply of lead feet were unavailable so an alternative supplier was sought. 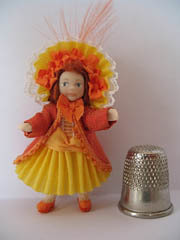 She also thinks that the maid is a Tomac doll due to her facial features. This rather smart Grecon lady is in fabulous condition and rare. However, another doll expert thinks that actually all of the dolls could be early Grecon, even the maid (with her wide mouth & suggestive eyes)? 'Tis possible. Another aspect that I found puzzling is that there are no Grecon labels on any of the dolls and not even a hint of there ever being one. 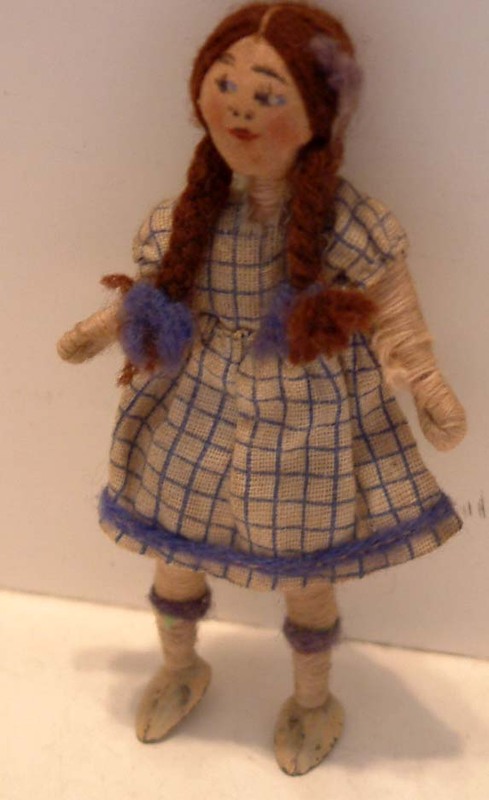 I know they did often fall off but with a few dolls like this I would expect there to be at the very least a remnant of one label remaining. 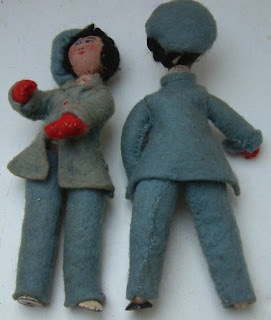 It has been suggested to me that as Miss Cohn who made Grecon dolls did not register the name of Grecon until 1940, maybe all pre war Grecon dolls did not have a label.......therefore making these pre 1940s? Regardless of whether all are Grecon or whether one or two maybe Tomac - there is no doubt that these are very old, absolutely delightful and would look fantastic in a vintage house....all waiting for a new home. 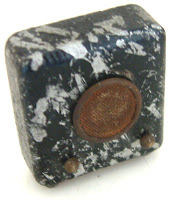 Below is a random sample of some of the other lovely old pieces that will be on sale at Thame. 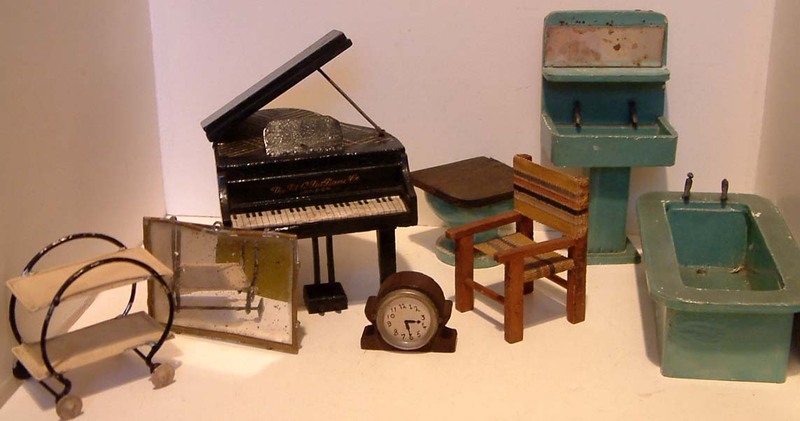 Assortment of Pit-a-Pat including rare "directors chair" & grand piano plus a German art deco trolley. There are some wall cupboards crammed full with cleaning products suitable for the 1930s/1940s era. Plus there are some wall food cupboards, two with 1930s products and one with 1940s wartime products with removable mock "glass" fronts. The packaging I have created myself and some of the packaging you will not have seen before (after all that research for the two 1930s General Store commissions, thought I would put all the excess packaging to good use)! 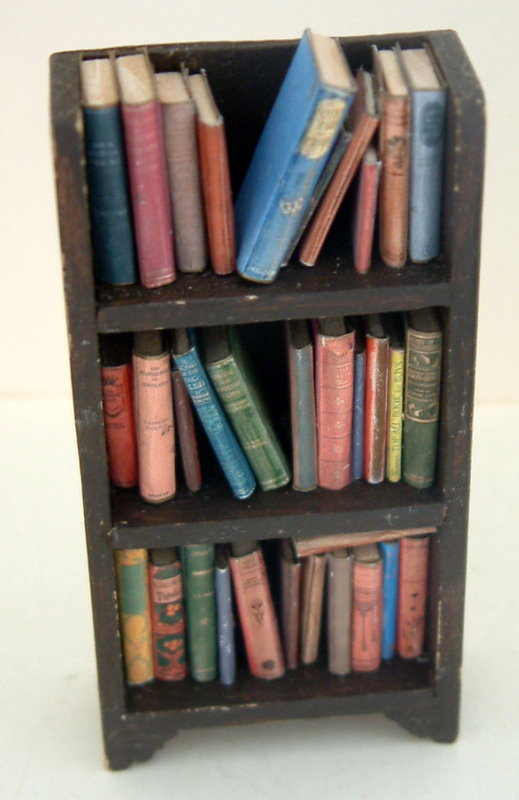 I have also made some more of my usual traditional 1930s bookcases too. These items are in 1/12th scale and will be first available on the day of the event, then all unsold stock will be listed on KT Miniatures website after. 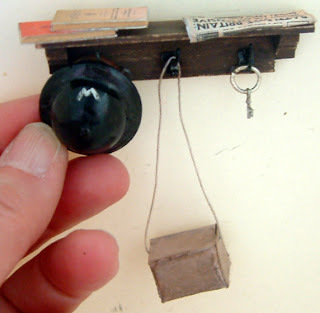 The majority of my handmade items have been created in such a way that they have an "aged" look to them for a hint of realism and many of these could be used in vintage dolls houses. 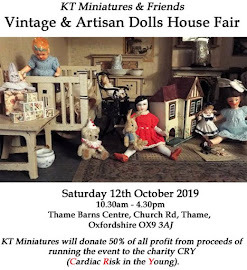 For a full current list of items that will be available on KT Miniatures stand at the event (handmade & vintage) please go to Thame Fair Stock Page. This is by no means a definitive list and is being added to constantly as there is a lot more to come!